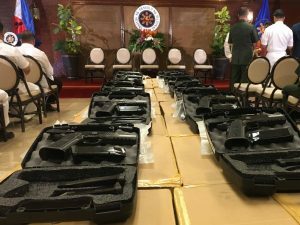 Armscor Global Defense, a member of the Israel Chamber of Commerce of the Philippines (ICCP), used to be a mere provider of firearms and ammunition. It has recently changed its name from Arms Corporation of the Philippines to ARMSCOR Global Defense, Inc. to reflect its corporate rebranding. From a manufacturer and seller of arms and ammunition, the company is repositioning itself as a solution provider for the security, safety and defense sectors. However, it will continue to carry the “Armscor” and “Rock Island Armory” brands for its products. ARMSCOR, as a part of its strategic pivoting, is ready to support governments and shift their business model to the military defense industry as a provider of defense, security, and safety equipment for the global market. 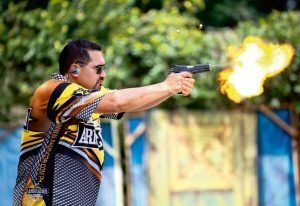 ARMSCOR Global Defense, Inc. (ARMSCOR) traces its beginnings to a print shop in Manila that happens to sell guns and ammo, motorcycles, and sporting goods. The Tuason family, owners of ARMSCOR, bought the shop and started their business manufacturing firearms in 1950’s. While so much has happened in the past 60 years, the company’s passion for providing quality and innovative arms and ammo at the best price remained. The company has a wide selection of products, including handguns and shotguns in pump action and their parts and accessories. ARMSCOR offers handguns of varying sizes, such as the Rock Island revolver series, the 9mm MAP/MAPP series, the 1911 TAC series, and the Compact Baby Rock series. The company markets rifles such as the bolt-action M14 Youth; semi-automatics like the MIG 22 and the M1600; and shotguns in pump action. ARMSCOR provides 22 TCM cartridges, ammunition for shotgun or rifle models optimized for hunting, tactics, or combat; magazines, grips, part kits, and knives. The company’s products are used widely by the military and the police.